THE CALM SEA, RADIANT AND BRIGHT with sparkling light, reﬂecting the dawn on its smooth surface, is a pleasant sight to the eyes. But it is far more delightful not just to see but to address the church gathered together according to God's will, freed from disturbances, illuminated mysteriously by the divine light, stirred up towards that light's dawn, with hands and eyes, all the senses and the mind uplifted. The grace of the Spirit has today granted me this agreeable sight. You are all spending your nights and days together here in God's temple, and by your unceasing attendance upon Him you could be regarded as heavenly trees planted by the streams of the water of the Spirit. So may I now assist these streams as far as I am able. As you have offered your daytime prayers in addition to your early morning prayers, may we, as far as time allows, offer an evening sermon in addition to the one this morning, that we might show you openly all the different kinds of tricks to which the enemy of our salvation turns his hand to render not only our fasting but also our prayer worthless. 2. Brethren, there is another sort of evil satiety and drunkenness which does not result from indulging in food and drink, but from anger and hatred towards our neighbor, remembrance of wrongs, and the evils that spring from these. On this subject Moses says in his song, "Their wine is the wrath of dragons and the incurable wrath of asps" (Deut. 32:33). So the prophet Isaiah says, "Woe to those who are drunken, but not with wine" (Isa. 29:9), and again he commands, "ye shall not fast to ﬁght" (Isa. 58:3 Lxx). To those who fasted in this way he says, speaking on the Lord's behalf, "If thou bendest thy neck as a ring, even then ye will not call this an acceptable fast, and if ye make many prayers, I shall not hearken unto you" (Isa. 58:5 Lxx), and, "When ye spread forth your hands unto me, I will turn away mine eyes from you" (Isa. 1:15). 3. This is the drunkenness of hatred which more than anything else causes God to turn away, and the devil attempts to bring it about in those who pray and fast. He prompts them to remember wrongs, directs their thoughts towards harboring malice, and sharpens their tongues for slander. He prepares them to be like that man who wishes for evil whom David describes with the words, "He deviseth mischief continually, his tongue is like a sharp razor" (Ps. 51:2 Lxx), and from whom he prays God to deliver him, saying, "Deliver me, O Lord, from the evil man: preserve me from the violent man; they have sharpened their tongues like a serpent; adders' poison is under their lips" (Ps. 140:1, 3). 4. In this time of fasting and prayer, brethren, let us with all our hearts forgive anything real or imaginary we have against anyone. May we all devote ourselves to love, and let us consider one another as an incentive to love and good works, speaking in defense of one another, having good thoughts and dispositions within us before God and men. In this way our fasting will be laudable and blameless, and our requests to God while we fast will be readily received. We shall rightly call upon Him as our Father by grace and we can boldly say to Him, "Father, forgive us our debts, as we forgive our debtors" (Matt. 6:12). 5. Again, he who schemes against our souls uses another means to render our prayer and fasting useless, self-conceit. Because that Pharisee was conceited when he fasted and prayed, he was sent away empty-handed (Luke 18:10-14). We know, how-ever, that people with proud hearts are unclean and unacceptable to God, and we are well aware that we owe God many large debts and pay back very little. So let us forget those things which are behind as worthless, and reach out towards those things which lie ahead (cf. Phil. 3:13). Let us fast and pray with contrite hearts, self-reproach and humility, that our fasting and our regular attendance and presence in God's Church may be pure and pleasing to Him. 6. Another of the evil one's methods of making our toil in fasting and prayer fruit-less is to persuade us to accomplish them hypocritically for the sake of vainglory This is why the Lord commands us in the Gospel, saying, "Enter into thy closet, and when thou hast shut thy door, pray to thy Father which is in secret; and thy Father which seeth in secret shall reward thee openly" (Matt. 6:6).7. He did not say to encourage us to excuse ourselves from gatherings and prayers in church, because in that case the prophet and psalmist would not have said to Him, "In the midst of the congregation will I praise thee" (PS. 22:22), or, "I will praise thee, O Lord, among the people: I will sing unto thee among the nations" (Ps. 57:9), or, "I will pay my vows before them that fear thee, Lord" (PS. 22:25). Nor would he have said to us, "Bless ye God in the congregations" (Ps. 68:26), or, "O come, let us worship and bow down and weep before the Lord our God" (Ps. 95:6 Lxx). The Lord teaches, be-sides other, higher matters, of which there is no time to speak now, that if we are stirred up to pray alone in our houses and bedrooms this also encourages prayer to God in church, and inner prayer of the mind encourages spoken prayer. If someone only wants to pray when he attends God's Church, and has no concern at all for prayer at home, in the streets or in the ﬁelds, then even when he is present in church he is not really pray-ing. 8. The psalmist demonstrates this because after saying, "My heart is ready, O God", he adds, "I will sing and give praise in my glory" (Ps. 108:1 Lxx). Elsewhere he says, "When I remember thee upon my bed, I meditate on thee in the morning hours" (Ps. 63:6 Lxx). The Scripture says, "When ye fast, be not, as the hypocrites, of a sad countenance: for they disﬁgure their faces, that they may appear unto men to fast. Verily I say unto you, They have their reward. But thou, when thou fastest, anoint thine head, and wash thy face; that thou appear not unto men to fast, but unto thy Father which is in secret; and thy Father, which seeth in secret, shall reward thee openly” (Matt. 6:16-18). 9. How incomparable is His love for mankind! With these words the Lord makes clear to us the distinction and decision He will make at the future Judgment, so that from now we might lay hold of the better choice and portion. To those who live for vainglory and not for Him, He will definitely say, in accordance with His words in the Gospel, "You received your reward during your lifetime", just as Abraham said to that rich man in the ﬂames, "Thou in thy lifetime receivest thy good things" (Luke 16:25). Those who look towards Him as they practice virtue He shall, it says, reward openly, which means that in the sight of the whole world He will give them in return His blessing, an inheritance, pleasure and pure joy for ever and ever. He wants nobody to miss this, and everybody to be saved and come to the knowledge of the truth (1 Tim. 2:4), so He makes clear now, as I said before, His impartial and unalterable choice, showing that only those who despise the glory that comes from men are sons of God. 10. He addresses the same words to both categories of people, saying, "Thy Father, which seeth in secret, shall reward thee openly" (Matt. 6:18). Those who are disdainful of the empty glory that comes from men He will make and proclaim his own adopted sons and heirs. The others He will exclude from adoption as sons unless they repent. The Lord says this lest, by considering how we look to other people when we pray and fast, which is of absolutely no benefit to us, we should endure the labor of fasting and prayer but be deprived of the reward. He tells us to anoint our heads and wash our faces, that is, we should not make a point of looking pale, nor should our heads be unwashed and dried up so that it seems that we are suffering from long drawn out fasting and contempt for our bodies, and are looking for praise from other people. The Pharisees acted like this for the sake of appearances, which is why they were estranged from Christ's Church, and the Lord forbids us categorically to copy them. 11. We can refer to the mind metaphorically as the head of the soul, since it is the soul's guiding force and to the imaginative aspect as its face, as this contains the permanent centre of the senses' activity. So it is good to anoint our heads with oil when we fast, namely, to render our minds merciful, and to wash our faces, our imaginations, clean from shameful impure thoughts, anger and everything evil. Such a fast carried out in this way banishes and puts to shame all the evil passions together with the demons who are their makers and guardians. It also enlists those who fast among good angels, turning these angels towards them, accustoming them to be their guardians and moving them to help and assist them. 12. In Babylon a fourth person was seen in the midst of the ﬂames alongside those three young men, who were adorned with self-control and fasting, keeping them unharmed and mysteriously refreshing them (Dan. 3:25). When Daniel kept a long fast an angel came to him to instruct him and to foretell the future (Dan. 10:1-21). At another time when Daniel had closed the lions' mouths by his prayer and fasting (Dan. 6: 16-27), an angel carried a prophet through the air from far away to bring him food (Bel & Dr. 33-39 Lxx). When we practice both spiritual and bodily fasting and pray, for us too the ﬁre of ﬂeshly desire will be extinguished with the help of good angels, and anger will be tamed like a lion. We will become partakers of prophetic food with hope, faith and inner vision of the good things to come, and we will be able to tread on serpents and scorpions and over all the power of the enemy. 13. Fasting which is neither like this nor carried out in this way is more akin to the evil angels, for their own abstention from food is accompanied by anger, hatred, pride and opposition to God. As servants and helpers of the good we are their opponents. "For we wrestle not against ﬂesh and blood", says the apostle, "but against principalities, against powers, against the rulers of the darkness of this world, against spiritual wickedness" (Eph. 6:12). We do not resist them just by fasting, but we use the breast-plate of righteousness to protect us, the helmet of saving works of mercy and the shield of faith (cf. 1 Thess. 5:8, Eph. 6:t6). Also the sword of the Spirit, which is more than sufficient for defense, that is, God's saving word to us (Eph. 6:14-17). So let us ﬁght the good ﬁght (1 Tim. 6:12), keep the faith ﬁrm, quench all the ﬁery darts of the evil one (cf Eph. 6:16), and, when we have been proclaimed victors in everything, we shall attain to pure heavenly crowns and rejoice eternally together with the angels in Christ Himself, our Lord. 14. To whom belong all glory, might, honor and worship, together with His Father without beginning and the all-holy, good and life-giving Spirit, now and for ever and unto the ages of ages. Amen. 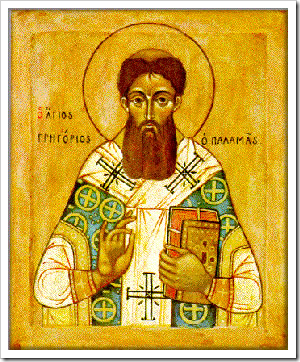 From Saint Gregory Palamas: The Homilies; Mount Thabor Publishing, Waymart PA; 2009 pp 49-53.